Super Kitty Cotton Jersey Pads with Fleece backs - Pick Your Size! Pink Shattered Hearts Cotton Jersey Pads with Fleece backs - Pick Your Size! Hand Dyed Bamboo Velour Pads with Fleece backs - Pick Your Size! Home > Cloth Pads > 8 Inch Light Flow Pads > Super Kitty Cotton Jersey Pads with Fleece backs - Pick Your Size! 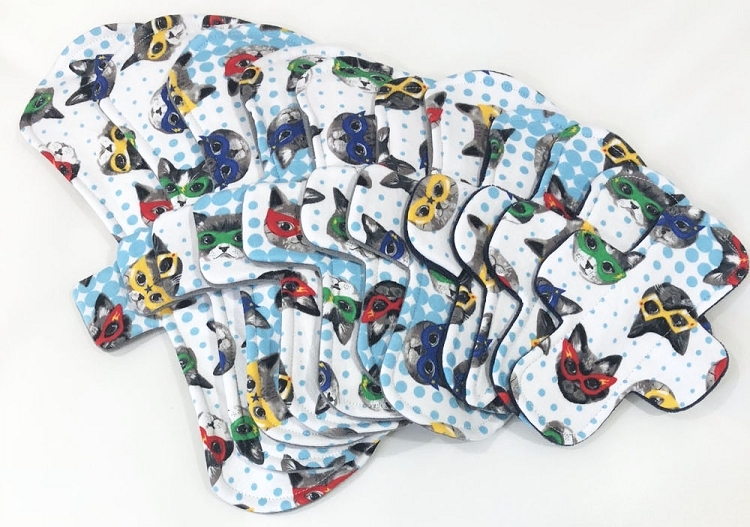 These pads feature a Super Kitty Cotton Jersey top. The pads are backed with Water Resistant Windpro Fleece and feature an absorbent core made of Bamboo Fleece. All of my pads and pantyliners have tab style wings and are fastened with a quality poly-resin snap. Caring for cloth pads is easy! Copyright Pink Lemonade Shop Cloth Menstrual Pads. All Rights Reserved. eCommerce Software by 3dcart.